It is believed at least one cable holding the cabin broke. The group had left a bar on the 95th floor of the building to go down to the lobby. The cause of the fall was said to be a failed “hoist rope” and the incident remained under investigation, a City Buildings Department official told the Chicago Tribune newspaper. It is still unclear how the lift came to a halt without hitting the ground. ABC TV quotes fire officials as saying two cables snapped but there were many others still attached. The lift that failed had passed its most recent inspection in July, reports say. 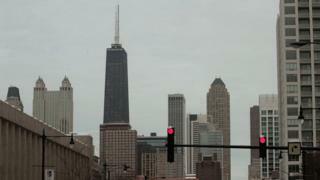 The building is the city’s fourth tallest and was renamed earlier this year as 875 North Michigan Avenue.